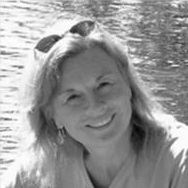 Jeannine Savard is an Associate Professor of English at Arizona State University, Tempe campus where she has been teaching on the creative writing faculty for over twenty years. Her work has appeared in a variety of periodicals and journals, and her most recent manuscript of poems will be published by Red Hen Press in late 2009 or early 2010. Her books in print include Snow Water Cove (republished in Carnegie Mellon's Classic Contemporary Series, 2006), My Hand Upon Your Name (Red Hen Press, 2005), and& Trumpeter (Carnegie Mellon University Press, 1993). near the kicked-in fronts of the DVD and ice machines. of canned chicken, liver, and fish for the cats. neck, and tail gleaming with sympathy. a real sense of—NOW BEING SENT. All the over-head lights blink off and on, and off again. There is nothing but a mild breeze ruffling the envelopes. if it's spirit or grace, or something gone past thought. I'm shuffling a whole world back into place. At my desk, a hint of yeast, uncooked bread. Through the window, lost bloom of an Ambarella Apple tree. Squawks from the distant Cedar. In Hindi, I heard, that's for time and death. 900 suicide-prevention programs across 400 military installations. 800 soldiers "slipped-through." Officials don't understand. Who can understand self-cancellation, completely? Who can understand self-approval, completely? Who can be safe and free to the end? Who can be free and safe to the end? an American," I received the call vibrating at my hip. I couldn't hear Jeremy's name. The reluctant messenger had to repeat. swarms of new citizens, the oath still warm on their lips. it's when the breadroot's fully grown on the plains. Yesterday, I called him Ground Apple. A practice, more than half-out the window, just a few toes left to count, to polish, though cherry red makes you shiver and cramp in the pit of your stomach. You have asked for no more dramas about people you know. News of a stranger is cleaner, no involvement except as far as an on-looker will go, a light reader's digestion. Since you have rules to go by, let's go with "things," like our town lake's dam bursting. It was an inflated rubber, the sun's intensity blew wide open, okay? But now, here I am, and can't leave out your uncle who's signed-on for collecting and transporting the fish still left in the mud pools meant for Tuesday, the alligator, held in some private herpe-tological habitat. Same uncle who cut the strings off your mother's apron one Thanks-giving. An odd bird himself, later a thief, just a few bucks here and there, but rehabil-itated or not, someone to whom you said "Never again." That is the problem, having to pull out one little piggy after another, until finally, there is not one left home to write about.